We entertain a lot around here. Sometimes I love to go all out and prepare large, very detailed meals that take a lot of time and effort, but usually that takes me away from being able to really spend a lot of time with my friends. So, most of the time, I prefer to fix up something that I can prepare ahead of time that I can just pull out and serve when we are all ready to eat. I found this recipe about 10 years ago, while I was shopping at my local wholesale club. 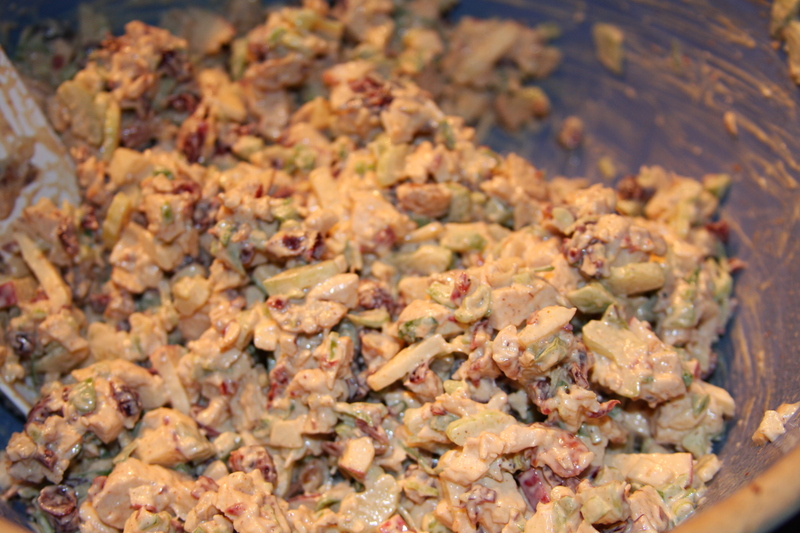 It was a recipe which called for using canned chicken (yuck! ), which I wasn’t about to attempt. I thought that if I tweaked it a little bit I could really make it perfect. This is really easy to put together and fairly cheap to make. You can serve it on any kind of bread you like to use. I always prefer something from the deli and this time we used a sour dough french loaf. You can also put it in a dish and serve it with crackers. Either way, it’s amazing. **For the Vegetarian version, just leave out the chicken. **For the Gluten Free Version, the salad itself is GF, just use gluten free bread or crackers when serving. Season chicken with salt and pepper on both sides. Heat some olive oil in a saute pan on medium heat until cooked through, about 3 minutes per side. I used almond oil this time instead of olive oil and it gave the chicken a really great flavor. Remove from heat and let cool. Chop into small pieces. My chicken kept disappearing and I couldn’t figure out what happened to it…until I caught this sneaky little sweetie girl taking pieces when I wasn’t looking! 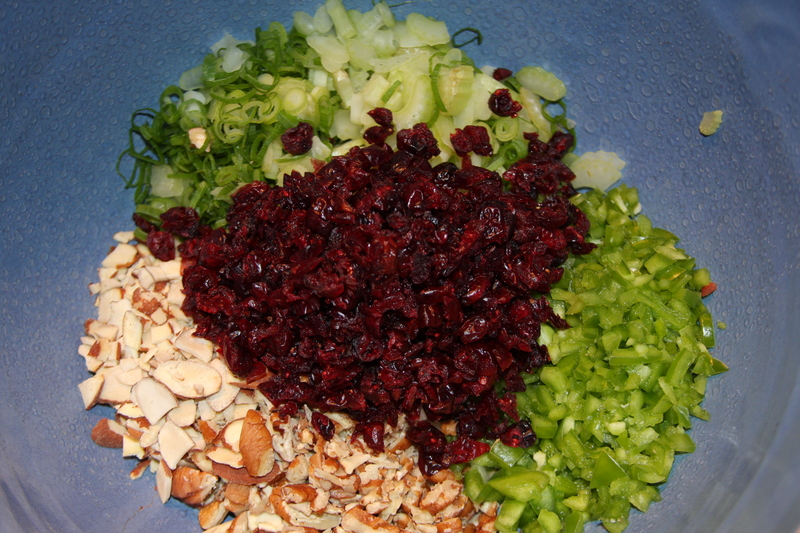 In a large bowl add cranberries, celery, green onions, bell pepper and nuts. We actually decided to alter the recipe a little bit this time and add in some apple. I had a large gala apple and we used about half of it. I just cut it up into small pieces to match the size of the rest of the ingredients. It really added a nice flavor and texture to the salad. 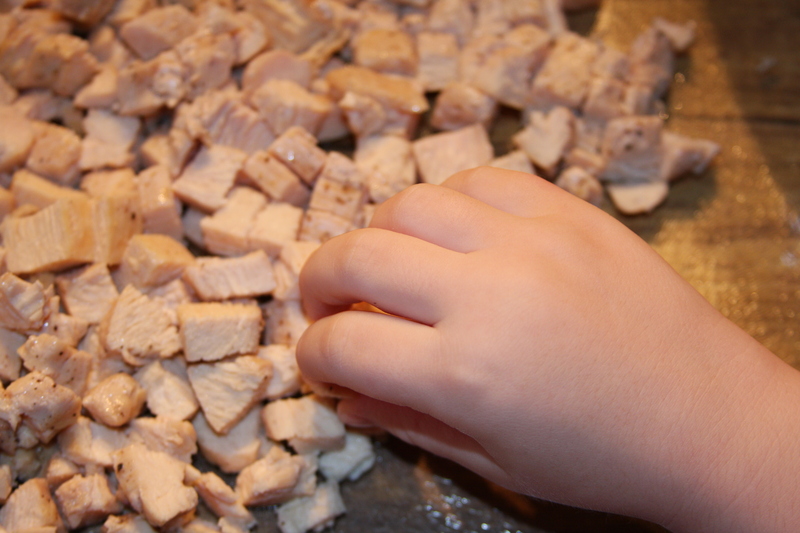 Mix in the chopped chicken, and mix well. I always add the chicken last so that it has had plenty of time to cool down before I add it with the rest of the ingredients. Add salt, pepper and paprika and mix until everything is coated evenly. Add in mayonnaise a little at a time until just coated. I never end up using a full cup of mayo, though you could if you want it a little more creamy. Taste to make sure it is seasoned enough, if not, add in enough to suit your taste. Chill at least one hour. 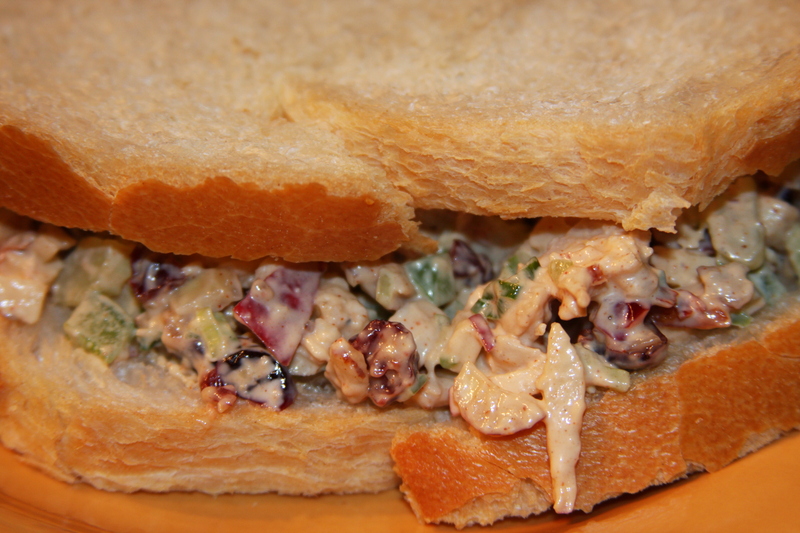 Serve as a sandwich or with crackers as an appetizer. This entry was posted in Appetizers, Chicken Dishes, Dips and Spreads, Gluten-Free, Lunch, Recipes, Salad, Sides, Snacks, Toppings, Vegetarian. Bookmark the permalink. Ummmmm…could you make this when we come in july? Pretty Please? I am pretty sure I can make that happen! Just remind me!